We specialize in wildlife control in the Los Angeles area, and we’re experts when it comes to opossum problems in Los Angeles. Most of the calls we get are for opossums in the attic, opossums living in the garage, opossum mothers with babies, opossums living under the home, and opossums ripping vents off the home. We also get many calls from Los Angeles homeowners who are experiencing a major flea problem due to opossums living on the property. Opossums are known to carry a heavy amount of fleas. Most of these problems are solved by trapping and removing the opossums. When opossums get in the attic it’s usually from the “gable” area of the roof. Most of these areas are left open from when the home was built. If it’s not left completely open and not sealed properly, opossums will rip into the attic in these areas. It is very common for people to use screen to keep opossums out; however, these wild animals are very strong. They can rip through the screen in seconds. We have seen cases across the Los Angeles area where opossums rip off a vent to the under floor of a home and move in under the bathtub. When your home is built, the contractor cuts a hole in the flooring for all the pipes to run up under the bathtub. More often than not, the contractor does NOT seal up around the pipes. This means the opossums can slip under the bathtub around the pipes and nest in the hollow area around the bathtub. We have removed many opossum families from this area. In these situations, the wall usually has to be cut open to remove the dead opossum. Once an opossum has made a home under the house, in the attic, or under the bathtub, it can be very messy. Opossums will defecate everywhere. They also bring in many things to nest with. In most opossum nests, we find plastic bags, dead grass, dog toys, and a bunch of trash. When Animal Capture is done getting rid of your opossum problem, our goal is for your home to be sealed properly. Whether we can seal it or not, we always recommend it be done right. 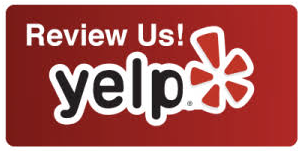 If you have any questions about animal removal in Los Angeles, Santa Monica, Beverly Hills, Brentwood, Woodland Hills, Malibu, Calabasas, Torrance, Sherman Oaks, Van Nuys, Encino, Northridge, Burbank, Hidden Hills, Manhattan Beach, Palos Verdes Estates, Monrovia, San Pedro, La Canada Flintridge, Pasadena, Hollywood, West Hollywood, Pacific Palisades, Santa Clarita, Canyon Country, Topanga, Valencia, Toluca Lake, Glendale, or any other community in the region, please call us at (310) 551-0901. 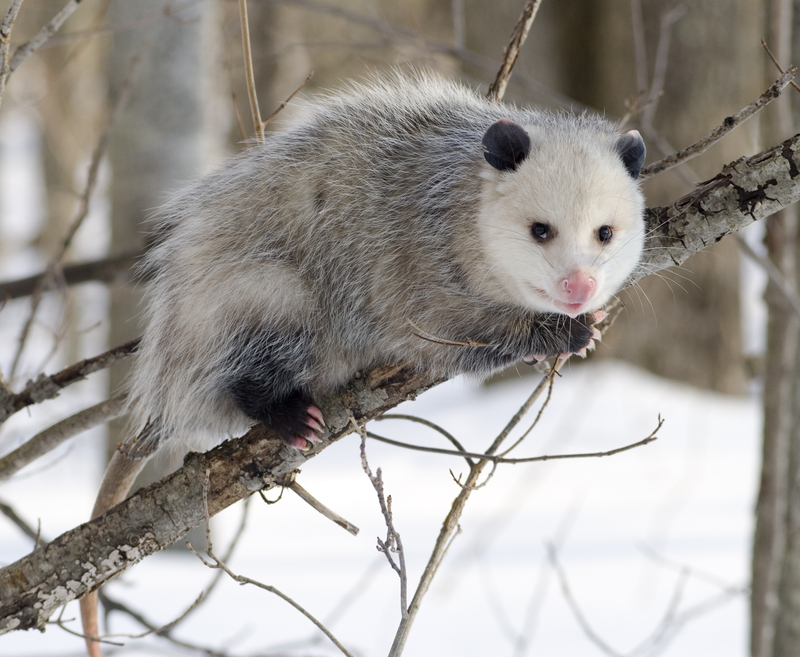 Opossums can be found all over the state of California, in both rural and urban areas. They are the only marsupials on the continent. 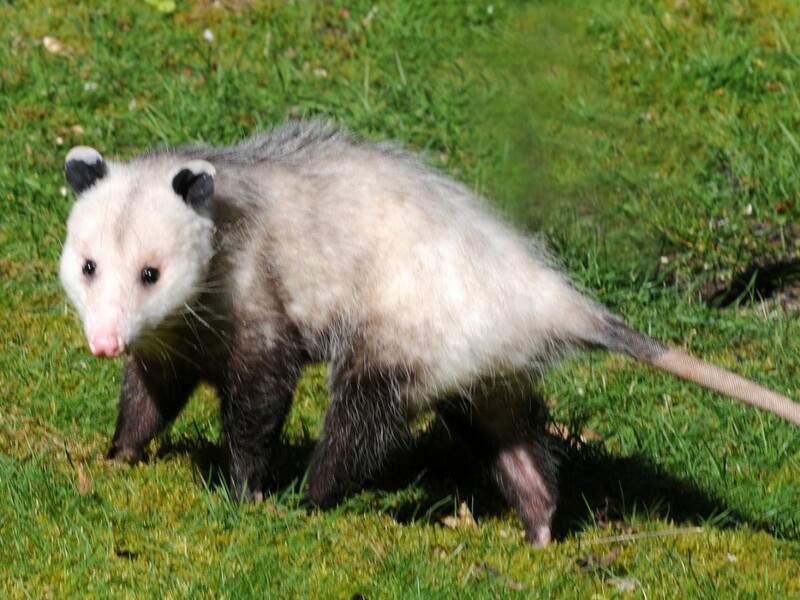 The opossum (Didelphis virginiana) is a mammal roughly the size of a house cat. Weighing 4 to 14 lbs., it sports moderately long fur whose coloration ranges from white to dark gray, which is usually lighter on its back and darker on its legs. It has a long, pointed face with thin, round, hairless ears. The opossum has fifty teeth, more than any other mammal in North America. Its tail is hairless, scaly, and prehensile. It has five toes on each foot. They produce two litters each year, and have a breeding period that lasts from January through November. The young are born thirteen days after mating, and quickly attach themselves to one of the female’s teats. They remain with the female for four months. Opossums are omnivores who are happy gobbling a very wide variety of foods: fruits, vegetables, meat, nuts, eggs, carrion, insects, garbage, and pet food. In urban environments, they often take up residence in garages, attics, chimneys, woodpiles, underneath houses, or anywhere else that seems like a safe habitat. They are nocturnal creatures, so they often escape human detection. The opossum tends to create offensive odors wherever they live. They can also cause serious damage to buildings through their habit of pushing in window screens, chewing through electrical wires, and tearing up insulation. They’re not afraid to attack wild birds and household pets, and often they’ll injure dogs and cats while trying to get at pet food that has been left outside. 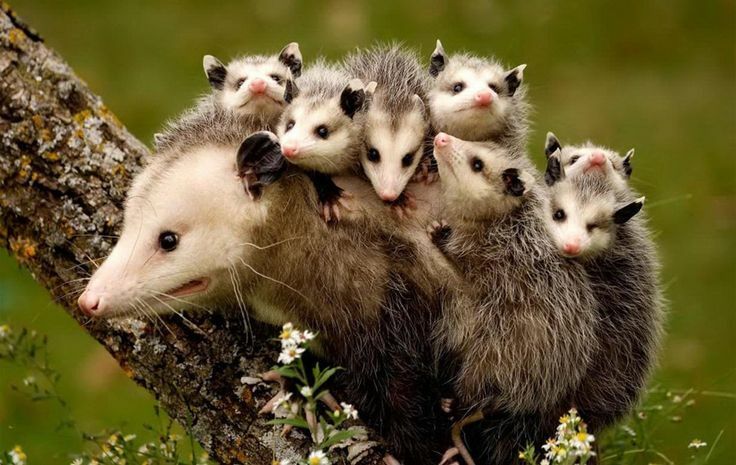 Opossums can transmit a broad variety of diseases: tuberculosis, herpes virus, relapsing fever, spotted fever, tularemia, salmonella, toxoplasmosis, trichomoniasis, coccidiosis, yellow fever, Chagas Disease, and rabies. They are also reservoirs for leptospirosis (a.k.a. hemorrhagic jaundice) in humans and animals. This disease is transmitted via the feces and urine of infected animals. Humans can become infected if they eat unwashed produce or fail to wash their hands before eating or putting cigarettes into their mouth. Opossums are not native to California. They are not threatened or endangered nor are they classified as game animals or furbearers. It is a violation of California state law for wildlife to be kept as pets. Only authorized wildlife rehabilitators are legally able to keep orphaned wildlife for any length of time.